"Put Captain Solo's toys in the cargo hold"
They're no good to me naughty. Submitted by: Roberto Velez Jr. If you're on the naughty list, all you get is a lump of carbonite. The Fett who stole Christmas. "....he's no good for my sled." He's no good to me red. Making a list, checking it twice, gonna decide if your head's worth the price. 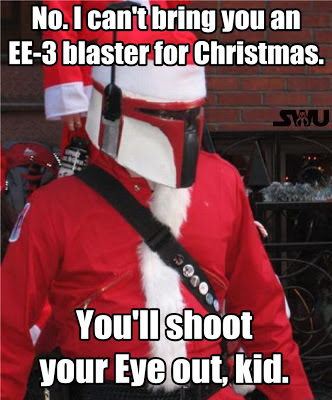 Boba Fett is coming to town. He'll take you if you're sleeping, He'll take you if you're awake, He'll take you if you're in carbonite, So pay your debts for goodness sake.